Highly reflective for enhanced visibility. Developed by 3M to help athletes be seen in nighttime and low light conditions. 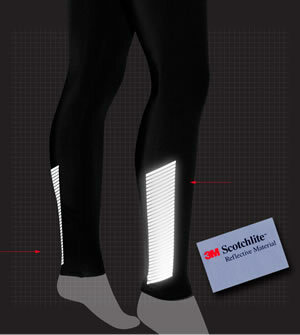 The 3M Scotchlight material provides increased visibility on the moving parts of the leg. This is extremely important because each year, many athletes are killed in traffic crashes. Of the total accidents, 65 percent of pedestrian fatalities occur between 6:00 p.m. and 6:00 a.m. Using Reflective clothing can increase visibility. 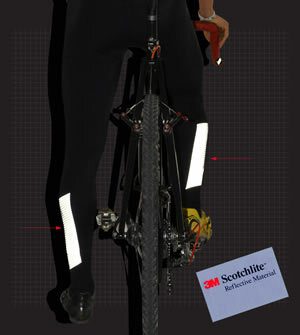 3M Scotchlite transfer films are composed of wide angle, exposed retroreflective lenses bonded to a silver fabric. Reflective films help enhance the visibility of the wearer in nighttime or low-light conditions when illuminated by a light source, such as headlights, by returning the light back toward the original source and reaching the car driver's eye. The Italian made chamois pad is excellent for long distance road or mountain bike rides. It has a seamless surface design with a three-dimensional combination of foams fitted together like a puzzle engineered to absorb road shock and act like a pillow on the saddle. 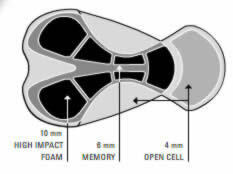 The fit is anatomically designed with a combination of elasticity and density. 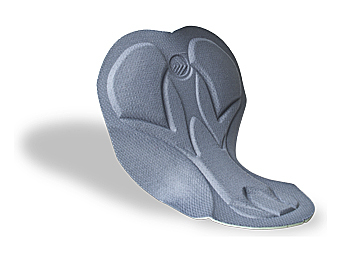 This pad tested in the excellent category by our product development team. Comfortable and great sizing/fit Thanks. Great product good comfortable padding just what I needed for a beginner. I like these as tights, the pad was all wrong, it was in wrong position, did not adequately reach to sit bones, and the edges were right under my backside. They chafed like crazy. I cut the stitching that held the pad on and now I have nice tights I can wear over a pair of properly padded cycling shorts. Have to roll up cuffs because they are l-o-n-g!